The Ministry of Public Infrastructure is informing the general public that Carifesta Avenue will be closed to vehicular traffic from today to July 1, 2016. This closure will be to facilitate asphalt work. 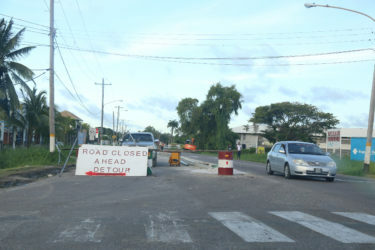 The northern carriageway of Carifesta Avenue closed yesterday. The Ministry also informed the public that Railway Embankment, between the Eugene F. Correia Airport Access Road and UG Access Road, will also closed for the same period – June 29 to July 1, 2016. Road users are therefore asked to use alternative routes for this period. Yesterday, the northern carriageway of Carifesta Avenue was closed. There had been no prior announcement of this.